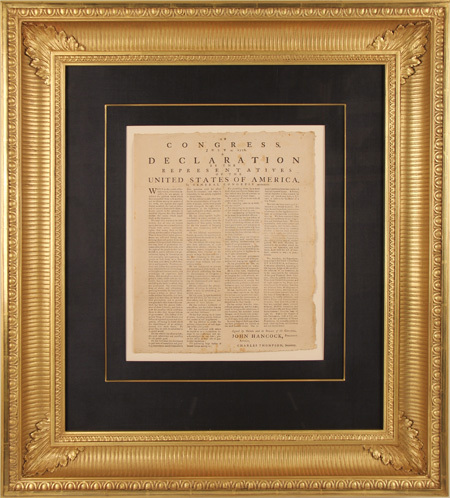 The rare first newspaper printing of the Declaration of Independence we auctioned yesterday brought $632,500—a record price for any historic newspaper. The sale was held with Robert A. Siegel Auction Galleries in New York City. The newspaper was purchased by David Rubenstein. The July 6, 1776, edition of the Pennsylvania Evening Post was only the second printing of the Declaration in any form. The copy sold yesterday is one of just four issues of the Post’s Declaration printing that have appeared at auction in the past 50 years. We have handled three of those four copies. 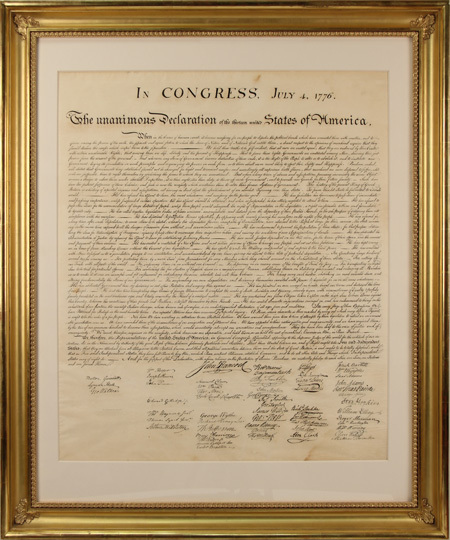 Another noteworthy sale took place June 21st at Christie’s, where George Washington’s 1788 letter to John Armstrong endorsing ratification of the Constitution sold for $1,443,750 net. To see our selection of great Washington documents—which includes several important letters—click here. We have a number of other scare Declaration printings at a variety of price points—just in time for the Fourth of July. All July 1776 broadside printings of the Declaration are rare and valuable, but this example is exceptionally so. It is the earliest known publication of the Declaration in Massachusetts—the birthplace of the American Revolution—and its unique, four-column format makes it one of the rarest and most interesting of the printings. Including this example, only six copies of this broadside are known, four of which are already in institutional collections. 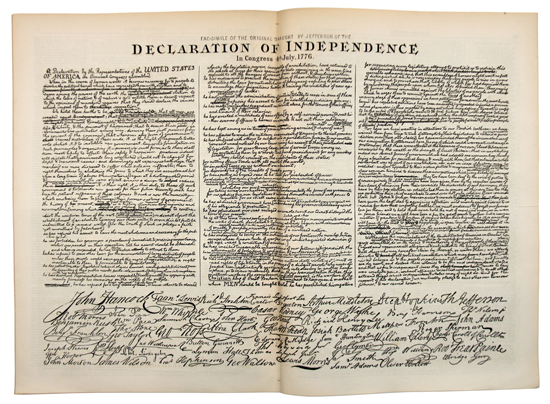 This second edition printing of the first exact facsimile remains one of the best representations of the Declaration as the manuscript looked when it was signed and prior to its nearly complete deterioration. Very little of the original is legible today. Originally bound into Peter Force’s American Archives. Another Stone/Force print. Copies that were never folded are far more rare on the market than folded ones. A 1791 printing of the Complete Acts of the First Congress, including the Declaration of Independence, Constitution, and Bill of Rights (which had just been ratified). This 1808 commemorative printing from the Philadelphia Aurora also contains “Freedom and Peace…Or, The Voice of America. A National Song,” along with other patriotic songs for the occasion. The July 8, 1876, issue of Harper’s Weekly, containing a supplement celebrating the 100th anniversary of the Declaration of Independence, complete with a centerspread facsimile of one of Jefferson’s draft manuscripts and the signatures of the signers, along with related engravings.